The holiday season is upon us, the year 2018 is almost at the end, and it is a good time to pause, look back and summarize what was achieved, what were our successes and failures. Panzer Corps 2 did not release this year. This is... not ideal. We will not try to pretend that it’s a good thing, “because now the game will be even better and more polished”. Back when we announced it, nobody planned to deliver a bad game in 2018 either. The good news is, the game is really turning out the way we hoped. It has come a long way since the beginning of development more than 3 years ago. We were taking many risks with this project, and it is great to see that for the most part, they are paying off. 3D graphics works and provides a level of clarity which we need. Random maps are fun to play. Historical content plays just as well. The game is 100% future proof and looks gorgeous on any displays up to 4K. We are confident that 2019 will be a “Panzer Corps 2 year” and that Panzer Corps will get a worthy successor which will deliver many hours of fun to all the fans of this genre. We would like to thank everyone reading these diaries for your interest in the game and for valuable comments and feedback. We cannot reply to every single comment, but we read them all. And although the end of the year has been a very busy period for us, we were able to react on some of the feedback as well. For example, just yesterday Scenario Editor has got a new feature to import any Panzer Corps scenario, which can then be edited and resaved in Panzer Corps 2 format. This has been requested in the comments to one of the diaries, and now it is implemented. Please keep your feedback coming, and together we can make this game even better. 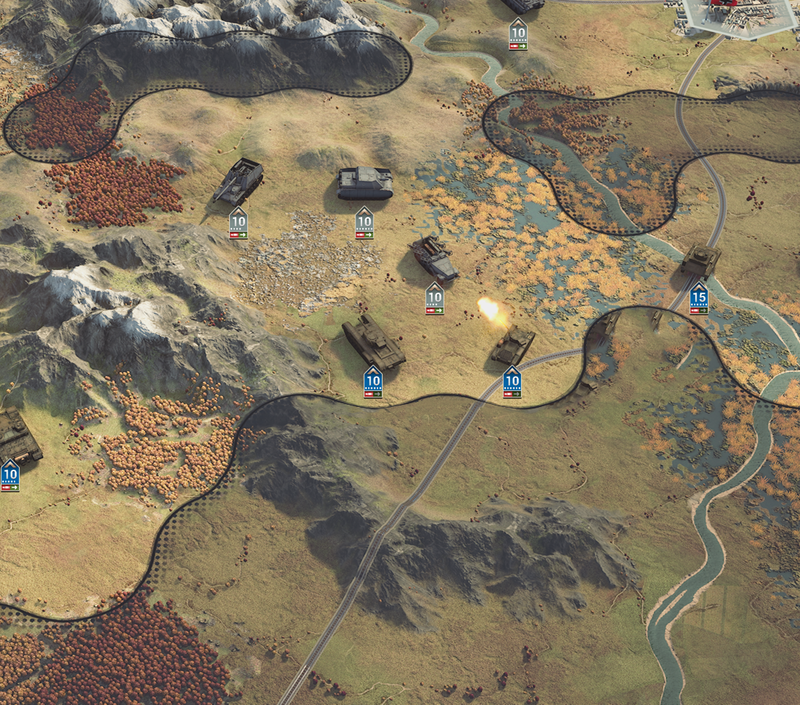 To show how Panzer Corps 2 looks now, we have prepared two new screenshots. Hope that you will enjoy them, and looking forward to telling and showing you more in the coming year. See you in 2019! Merry Christmas and Happy New Year! Thank you for your candor-- and it's looking GREAT! Whoa this is looking better and better. Just awesome, love this idea, and love it if we can do that in multiplayer. I will admit I was not super excited when this announcement came out, as I am one of the biggest fans of Panzer Corps out there and have difficulty accepting something new, but this has been building up my anticipation. Each new info you have leaked out has wetted my appetite more and more, and now with this piece of news along with that screen shot, I have gone from starting out skeptical, to where I have been building up my interest to the point I am at right now, which is genuinely excited about this coming out and looking forward to getting my hands on playing these new tweaks on a new platform. Any chance of a screenshot with the hex boudries turned ON please? Thank you for not resorting to platitudes such as the one shown in quotations. That's refreshing. Delays are, as you say, not ideal. For studios it means higher costs for what will ultimately be the same revenue. For fans it means longer waits. What delays never mean is that the game will be better than originally intended. That's just not how it works. Best case, things turn out "the way we hoped". Thank you for that, and I look forward to reading about the results (though I won't be playing it due to Slitherine's poor Mac and iOS support, but that's another matter). As for the screenshot, the zoomed in units are beautiful and the shadows are finally turned down enough for the units to be visible. In the more zoomed out view, where quick unit identification is more of an issue, unnecessarily dark shadows continue to hinder, but less than in Dev diary 4, for example. There is no need to turn the hexes off in screenshots posted here. I realize you want them off in promo shots and PR, to make the pictures look extra beautiful, and that's totally fine. But we're already fans of the game. Show it to us the way it's actually going to be played. In real life, the hex borders are important and we want to see if they are done right or not. Rotating turrets is such a small thing, but a nice thing. I wonder how the game decides when to turn the whole body and when to move the turret. Movement for body, defensive action for turret? Can't be, because there are images of turret twisted tanks looking at each other. I'm hoping this is a nice feature and not just a visual mock up that doesn't actually end up representative of how the game will actually work. Regarding porting maps, I guess it has been a requested feature. I'm uncertain where things stand with old campaign content. Like aren't there supposed to be all new rules in this game, I would think quite a lot of the more complicated mechanisms would break. Sure you can just bring the base map over, but the complex triggers and scripts and settings... It would be nice to bring over some of the best multiplayer maps over directly, but I kind of am more interested in making new and better ones, not just relying on the old. I don't think I like how the fog of war looks. There's something not right about it. Compared to Panzer Corps original, it's far more glaring. Especially the edge with the checkerboard pattern. In fact, yea it's that checkerboard pattern I hate. It's far too busy and way to distracting to the eye. For sample, I removed a section of the checkerboard pattern and it's very much nicer to look at. I guess you did this to make the boundary between fog of war and visible terrain more prominent, but I have to say I don't like it. It's too busy, too fancy, and it looks like something that is conveying some really important information when in reality it's nothing but glitter and fluff. The thick black line already defines the fog of war boundary, and the shaded area already denotes regions of no visibility. What purpose does the checkerboard function? None. And it's far too busy of a design pattern to simply be doing nothing. Are you sure that's the fog of war you're seeing and not the supply line? If so when does the supply line appear, i.e. how do we know when a unit is considered "surrounded"? There are supply lines? I don't recall that being mentioned ever. Do you have a quote or reference on that. Also, are you saying that four hex block under the mountains is a supply lined area? Surely not. 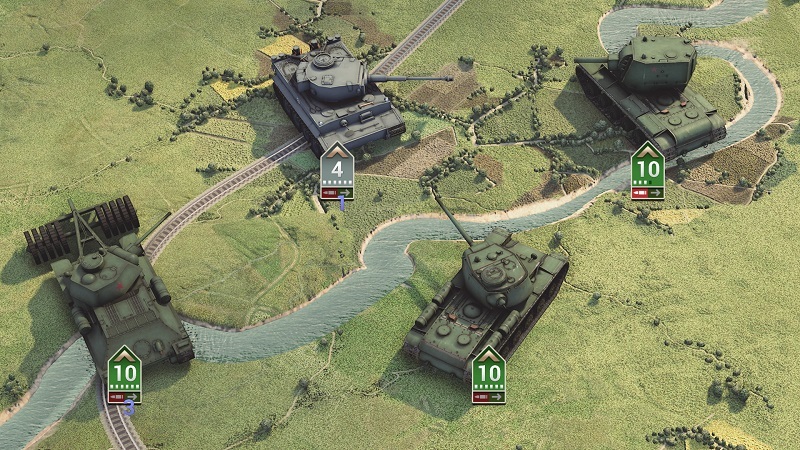 Encirclement - PC2 won’t have a full-on supply system like Order of Battle, but the dev team are keen to bring in the tactical implications of units being out of supply. A unit that’s surrounded by enemy units so that it can’t move onto any passable terrain hexes will be considered ‘out of supply’ and will start to suffer combat penalties over time. 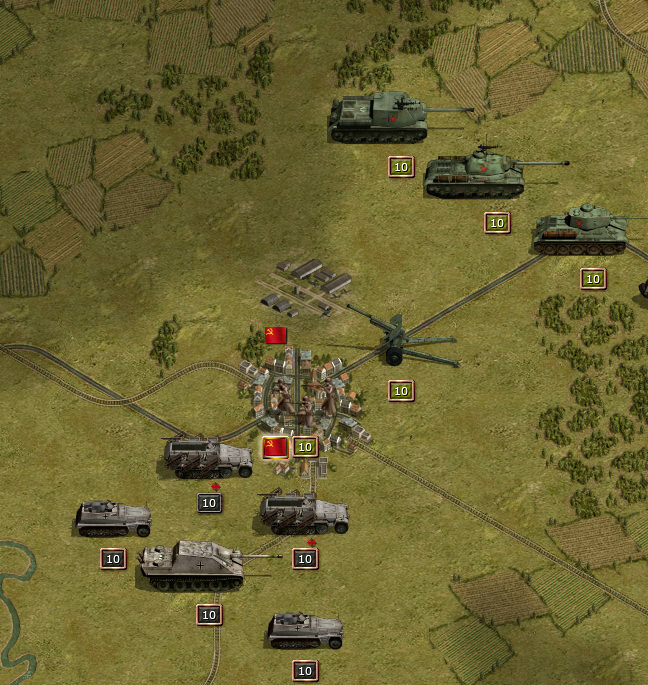 There are no 'supply lines' in Panzer General or Panzer Corps. i.e. how do we know when a unit is considered "surrounded"? Above quote defines pretty clearly what surrounded means. In dev diary #1 there is a clear red dotted line to indicate encirclement (along with a solid black for the fog of war). There has to be an indicator, or things would rapidly get confusing if, for example, you encircled units from a distance outside the fog of war- the enemy player wouldn't even know they are encircled without indication! That indicator could have changed over time. Since there is only one indicator in the recent screenshots, and it doesn't match either of the old indicators, you have no way of knowing if its the encirclement one or the fog of war. Also, there is nothing, and I repeat, nothing, "clear" about the concept of encirclement. How close do you have to be? Do ports or airports abrogate encirclement? There are a lot of questions left unanswered. Ahh I see what you mean. In that case you are right there are questions. Especially when units are cut off relative to where? I thought encirclement was literal, 6 enemies adjacent in every direction. I think the biggest problem with supply models that games try to do is you can't really have units perform breakthrough or independent actions. If they get supply cut they instantly become dead meat. If I remember right OOB had to make special rules for units to function in the face of this, like paratroopers have a limited time where they can function normally before they enter a no supply status. Otherwise they just don't function. I hope they go with very simplistic supply models, staying true to its Panzer General roots. One of the biggest problems with supply lines is getting them to stretch and work. If you can see where the enemy supply boundaries are, you get free intelligence through fog of war of where their units are because they are advancing in that location, as seen by enemy supply influence area growing. Whereas with traditional Panzer General, interference with supply was realized through the effect of being near enemy units had, causing you not to be able to fully resupply and reinforce. Simple, present, and effective. 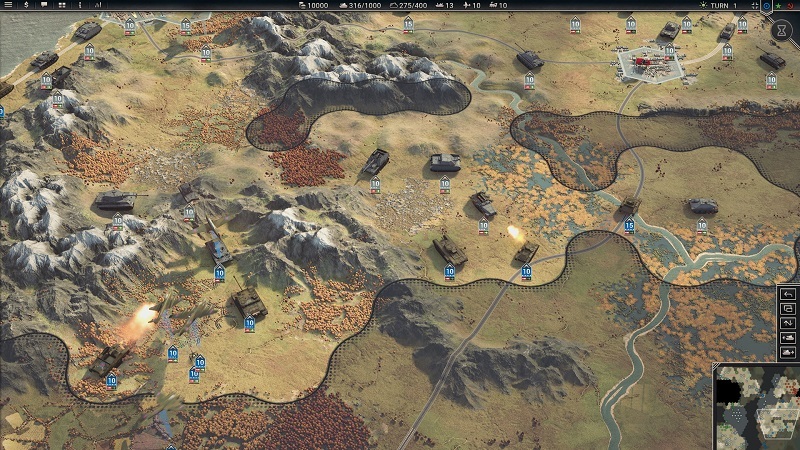 As soon as you can cut off unit supply by not directly interacting with those units, but interacting with the terrain and cutting of passable access (passable access to where exactly?) you need to start defining where supply comes from and how it gets to where it's going. Nowadays very hard to find a good development team to come out such as good game. A lot of big company busy with fancy things rather than deep playing good game. I would have to agree with kerensky about removing the dots (next to the thick black line) in the picture, it definately looks better without. Really nice look overall, agree. But I think you should do something about the graphic of the railways going over the mountains. Maybe a little tunnel or something. Looks a bit strange in the screenshot, that's all. Also, I would've liked to see how the bridges are done. Are they not ready yet or why's there always some unit placed on them? everything looking very good, but Im afraid about the scale of the models...for me personally they are too big..what about the infantry, when can we see infantry units? i think also it looks much better now - but the fields are more western europe bocage style. Can you show us also large wheat fields over many hexes typical for russia and where are small villages - the terrain looks like eastern Siberia without urban structures and paths. Yeah, it's definitely more complicated than just having a six units surround, because in diary 1 you can surround multiple units at once, and potentially cut off a peninsula with just one unit. It may well be that surround requires every single hex in a circle to be occupied and the indicator only shows up in that situation, but even then you could still use the indicator to see through the fog of war in certain situations e.g. a unit with vision of 1 could be surrounded by 12 units none of which it can see. So much remains to be explained. Although supply is something people were clamoring for, it is actually a really complicated topic. Historical surrounds could have no effect or result in instant surrender depending on a whole host of complicated factors that just aren't modeled in this game. For example, Soviet forces became less inclined to surrender over time as it became apparent that the Germans weren't going to win anyways and were going to abuse their prisoners.